a safe, healthy, thick lawn without using synthetic chemicals and pesticides. You know the old adage, use the right tool for the right job. Well that definitely applies here. Just like it's possible to drive a nail into wood with a pipe wrench, a hammer does a faster, better job. Many people buy a string trimmer and try to use it as an edger in the hope of creating a nice clean edge where their lawn meets a sidewalk, driveway or path. Many trimmer heads can even be repositioned to make it easier to edge or may even be called a trimmer/edger but in reality, a string trimmer is good at maintaining an edge but a dedicated edger will do a better job creating the edge. The WORX GT Cordless Trimmer/Edger is a perfect example. It has a set of wheels to make it handle like a stick edger, but that little .065 trimmer line and an 18V battery won't cut it on lawns that haven't been edged in a long time. String trimmers are great for trimming around obstacles like walls, light posts and other areas where your mower is too big to go. If the head is repositionable you can also use it to maintain the edge of your lawn. You should use a string trimmer every time you mow your lawn to finish off areas the mower didn't get and to trim the grass around your edges. I like the convenience of using a cordless trimmer. You should edge your lawn about once a month provided the soil is dry. It digs in deeper than a string trimmer and creates a little separation between the lawn and the concrete. If you're looking for a Cordless Trimmer take a look at my more recent article on How To Choose The Best Cordless Trimmer. Where I discuss some newer trimmer models and go over my experiences of having used a cordless trimmer for a couple of years. It includes tips to get the best out of your trimmer and more out of your batteries. As bad as string trimmers are at edging, cordless string trimmers are even worse because they have less power than even electric string trimmers.That's not to say you should buy one, I have one and it's great. But a string trimmer is not a great edger. No matter what the advertisements say. I have been reading reviews of the Worx GT Trimmer for a long time because it looks like such a great concept but the reviews weren't great. When I saw the infomercials and videos online from Worx, I noticed that the lawn edges they were using the tool on were already pretty clean. They just needed a touch up. In the end I decided to get an Factory Reconditioned Black & Decker NST2018R 18-Volt Cordless Electric 12-Inch Grass Hog String Trimmer because there are some other cordless Black and Decker tools I'd like to get in the future, I'm more familiar with the Black and Decker brand, it had a lot of good reviews and it came with two batteries! I saved a lot by getting a factory reconditioned trimmer. They are sometimes available from CPO Outlet with free shipping. The model number for a new trimmer is NST 2018 and a reconditioned one is NST 2018R. I'll do a full review after some more time with it, but I'm pretty happy with it so far. A good plug in or gas powered string trimmer will have more power, but to get a nice clean edge you'll need a bit of practice and a steady hand. Trimmers are great for what they are meant for, trimming around areas where the lawn mower can't get to. Edgers do a much better job of what they are meant for, edging. A decent gas or electric powered edger isn't that expensive and it will give you a nicer edge in less time with less work. Instead of using a thin piece of string, an edger has a metal blade that cuts through the grass, weeds and dirt to create a professional edge in your lawn. They have wheels and guides to help you make a straight edge. There are even some manual edgers if you don't want to mess with gas, oil, extension cords or cordless batteries. Since edgers are primarily designed to be cutting vertically, they seem to also be better at keeping rocks and debris from kicking up and breaking a window or worse, hitting someone. They can be used where the lawn meets a hard surface such as a driveway, sidewalk or path as well as around flower and vegetable beds. They even cut deep enough that you can use them to create a trench to run low voltage landscape lighting. You may be thinking "Great! One more tool I have to drag around the yard." It's not so bad since you don't necessarily have to edge every time and when you do use an edger it cuts through tough edges faster than a string trimmer. In between, if you decide to use your string trimmer as an edger, you'll find it goes easier after you've established your edge with the edger. There are three basic types of edgers mechanical, stick edgers and walk behind edgers. Mechanical edgers are human powered, stick edgers are a quick way to get a nice edge with a small tool. Walk behind edgers are heavy duty pieces of equipment that can get you through some really overgrown areas. There are only two options in electric edgers that I would consider. The first is the Black & Decker LE750 2 1/4 HP Edge Hog. Update: Since I've posted this article I've been using a Ryobi Li-Ion Cordless Edger (click for full review) and I've been using it pretty much exclusively for edging because of the convenience. I was shocked that it works as well as it does. The Edge Hog looks to have enough power and is easy to use. The price is very good and it has many good reviews. It has an adjustable depth to allow you to control how deep you want your edge, or to use it as a shallow trencher for things like landscape lighting wires. It's pretty light and has a brake on the blade so that the blade stops spinning when you let go of the trigger. The other electric edger I would consider is the Mantis Electric Tiller which comes with an edging attachment. While it's more expensive than the Black and Decker Edge Hog, you can get a number of attachments for it which makes it more versatile. One tempting attachment is the dethatcher attachment which allows you to use the Mantis Tiller as power rake. And there's the obvious tilling and cultivating which can be handy in the vegetable garden and when planting new beds or a complete lawn renovation. The Mantis Tiller is also available in 2 cycle and 4 cycle gas versions. Gas edgers are a bit more powerful than their electric counterparts. If you need to reach more than 100' away from an outlet, they're you're only powered option. You trade off the hassle of an extension cord for the hassle of maintaining a gas engine. You have two main options with a gas powered edger. A stick edger , or a walk behind edger. A stick edger is a lightweight edger that is about the size of a gas powered string trimmer. Unlike a string trimmer, it has a metal cutting blade instead of plastic string, the cutting direction is vertical and it has a wheel to make it easier to guide. Using a stick edger is going to give you a straighter line than most people can get with a string trimmer in the edging position. You'll also get the job done faster. It will also through some tougher edges that haven't been maintained in a long time. If you already have a gas powered string trimmer, you may be able to find an edger attachment that will allow you to use your string trimmer as an edger. A gas powered walk behind edger will give you more power than a stick edger. If you have a lot of edging to do this might be the edger for you. Walk behind edgers generally dig deeper. Instead of just one wheel to help stabilize the unit like a stick edger, it fully rests on it's wheel base allowing for a more precise depth throughout the cut. If you have the space for it and a lot of edging or trenching to do, this will make your life easier. Before gas and electric powered edgers, there were manual tools that would create a clean line along your lawn. You could use a plain square spade to or a rotary edger pictured right. The rotary edger can be a bit difficult to use but it works and you can still by one today. A more recent manual edger is the Steppin' Edger (HDP 6-4) from Hound Dog, the makers of the popular Weed Hound and Turf Hound. The Steppin' Edger cuts a clean edge in your lawn. As the name implies, you simply step on it to force the cutting blade down and working your way all along the edge. I tried one out and was very impressed. It can get through some very overgrown edges, leaving a clean line. It's not difficult to use and very affordable. Whichever edger you decide to get, I'm sure you'll be happy with the time you save and the quality of the results compared to a string trigger. I decided on an edger and you can read my Black & Decker LE750 Edge Hog Edger review. Was this article helpful? If so please help by sharing it. 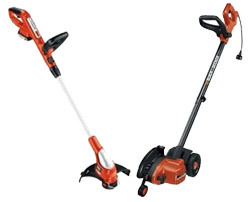 Get the B&D Electric Edger to go along with your cordless string trimmer. That's what I have and I couldn't be happier. The string trimmer goes through line really fast so I don't like using it for edging. You're right, you don't have to edge everytime you mow and I don't find using a cord too difficult but I used to use a corded string trimmer in the past for years. I trim every time I mow with the cordless which I didn't always feel like doing with the corded though. Thanks! I wound up getting the black and decker edger. Now if it would only stop raining. Get Organic Lawn Tips & Article by Email Free! Is Compost Enough For My Lawn? The Best Composter Is The Cheapest! Copyright 2008-2013 All Rights Reserved. Powered by Blogger.